Captain Haddock simply cannot believe it, but human trafficking really is still going on, even in the twentieth century (and today in the twenty-first century). The Red Sea Sharks lifts the veil on the scandal of the modern day slave trade. Hergstayed abreast of current affairs, and as was his style, for this story he wove real-life news into action-packed adventure. In classic literature a story does not usually start at the end, and nor do comic strips usually begin with the words HE END And yet this is exactly how Herglaunches the story of The Red Sea Sharks. The front cover brings a dramatic scene up close to the reader. The choppy green and white water is in stark contrast with the wide black area that frames the central picture. The white letters of the title further accentuate the drama. This unique and striking Tintin front cover stands out; it is a bold success. The title-page illustration plunges us straight into the heart of the action. There is no mistaking the situation: the S.S. Ramona is a target. Hergchose to put the reader behind binoculars and a periscope for the first two pictures of the book, evoking naval combat and torpedoes. Things look desperate from the outset! Walking out of the cinema with Tintin, Captain Haddock bumps into an old acquaintance, General Alcazar. The force of walking straight into the Captain knocks Alcazar's wallet out of his pocket. Inside the wallet Tintin and Haddock discover photographs of fighter planes. 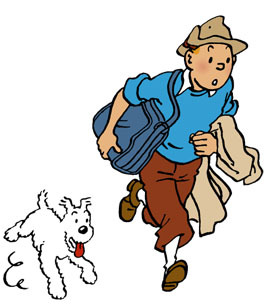 As they try to return the wallet to its owner, Tintin and the Captain discover that Alcazar has lied about where he is staying. They also find out that he is buying military aeroplanes in a bid to oust his rival, General Tapioca. As Tintin tries to describe Alcazar to a hotel receptionist we see the one and only sketch Tintin draws throughout the entire series, and it is quite a good likeness of the swarthy general. An Estonian pilot and one-eyed mercenary, Hergintroduces Skut as an unlikely ally to Tintin and Haddock; the author also brings the character back later on in the series in Flight 714. Skut manages to stimulate a new insult from Captain Haddock: "lithering bombardier!" In a cafnot far from the hotel in which General Alcazar says he is staying, Tintin orders two mineral waters. Doctors will advise you to drink this water, rich in substances conducive to good health. But Captain Haddock would like a different type of drink; he takes advantage of Tintin's brief absence to make a telephone call to get himself a glass of his favourite poison. If Tintin was as attentive as the reader, he would notice that while he was away an extra glass has appeared on the table. And it does not appear to contain water. The leopard may well be the fastest, fiercest animal in the wild, endowed with power and flexibility, but it is no match for a rock on the head. Luckily for Snowy, the beast believes the little white fox terrier has knocked him out! As the leopard limps away defeated, Snowy shivers in his master's arms. But even a fright like that is not enough to shake the bone from his jaws! Allan knows exactly what he is doing when he asks Captain Haddock the infamous question about sleeping with your beard above or below the sheets: he is out to cause trouble. Underneath the rough and unsavoury exterior lurks the mind of a cunning psychologist, capable of stirring up his adversary with a few simple words. A shark swallowing a mine is not going to go by unnoticed. Especially when it explodes. The red speech bubble, taking up almost all the available space at the top of the frame, says it all. Question marks are dotted all around. The question marks come from a US Navy seaplane, the Los Angeles cruiser, the Ramona cargo ship and the submarine of Rastapoulous, alias the Marquis di Gorgonzola. The question marks could practically be the cardinal points, located at the four directions of the compass. In the 1950s the general public could not get enough of real-life adventure stories; magazines and newspapers published articles about popular scientific endeavours. Hergread about the journey of Doctor Alain Bombard across the oceans of the world in a small boat. Later the author of Tintin wrote to the French biologist and physician, and in the end wrote Doctor Bombard's name into The Red Sea Sharks: on page 36 Tintin refers to the Doctor's survival techniques. Tintin and Piotr Skut may not be sea gherkins like Captain Haddock but they still would never have drunk sea water. That should never be done, even in a survival situation, and it's hard to imagine that Herge did not know this. One of the best Tintin Adventures has the lot .